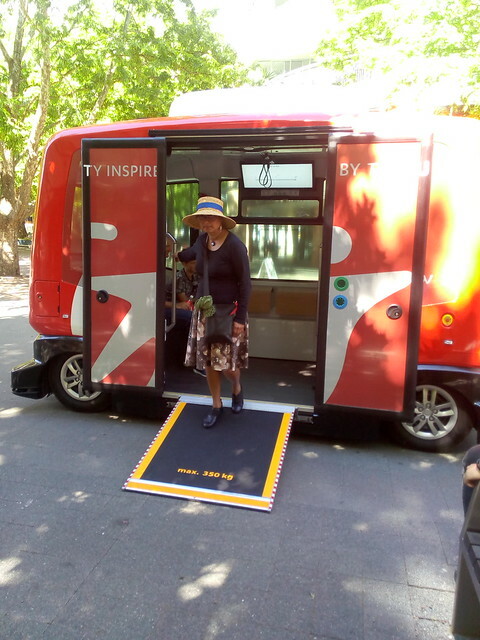 Yesterday I went for a short ride on an EZ.10 driver-less electric shuttle bus from company Easy Mile, on demonstration run in Canberra's city center. The bus traveled a few hundred meters through Canberra' central mall. While it has a maximum speed of 40 kph, this was done at walking pace, as it weaved in between the street furniture. The vehicle hold six people sitting in two rows facing each other and with room for another six to stand (or a wheelchair). There are very wide doors making entry easy. The vehicle is higher than it is wide and looks more like a cross between a lift and a golf buggy than a bus. The ability of the vehicle to find its way between the obstacles in the mall was impressive, with a smaller turning circle than even a mini-van. Also it was able to deal with pedestrians who strayed into its path. When the vehicle's sensors detected a person it would first ring a bell (like that of an old fashioned street car), then slow down and, if the person was not out of the way, stop. No one seemed perturbed or frightened by the vehicle slowing making its way along. There is also a wheelchair ramp which can be deployed by the press of a button (the vehicle also kneels to make entry easier). This would appear a practical form of transport around a university campus (the Australian National Universality could do with a half dozen such vehicles), or a city center. It would be a useful way to get people to and from light rail and other more conventional forms of public transport. While the EZ.10 is imported, this is an industry which Australia could enter. There are already Australian companies making small electric vehicles for farms, factories and the military. Our universities and high-tech companies have the expertise to design the software for the sensors to operate the vehicle. The EZ.10 shuttle is on an Australian tour it will be in Canberra today (Sunday) until 12 Noon and 1pm to 3pm, then Cairns from 4 to 8 December and Mooloolaba from 14 to 16 December.